I had organised a lunch with some girlfriends in the early summer. There we were all setting the table on the patio for an outdoor lunch, each with a wonderful dish of scrumptious flavours to share when this stunning creature of nature flew into my conservatory kitchen. It was huge. The body alone was the total size of my hand. Of course, it was frightened and panicked but luckily I am prepared, living in a countryside environment, for such occasions with my pink fishing net. We were all excited so we all had to calm down to transmit a peaceful energy to the amazing dragonfly and also concentrate on trying to catch it without harming it. It was one person here, one there, a swoosh and it was in the net. Hooray! It suddenly seemed to know that it was safe and we meant no harm. It just stopped flapping and stayed still so that we could all ooh and ahh over its stunning beauty and colours. It was like it knew we admired it and it waited till we took this picture and then it slowly lifted it itself out of the net. hovered over us for a little bit and then flew away leaving us in awe of nature and its beauty. 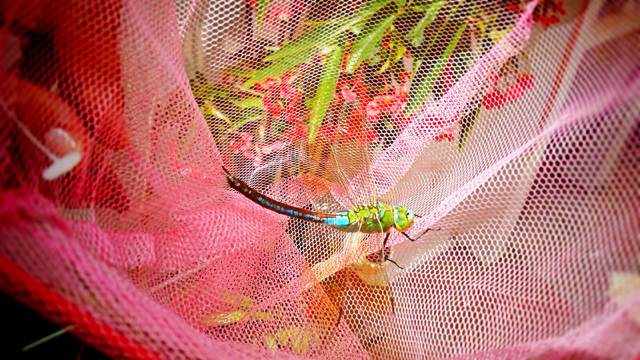 Dragonflies are amazing. In most parts of the world, it symbolises change. Change in the perspective of self-realisation, change that has its source in a mental, emotional and spiritual understanding of the deeper meaning of life. Because of the way a dragonfly glides skimming over the top of water it represents the notion of going beyond what’s on the surface and looking deeper into the implications and aspects of life. I love making my dragonfly necklaces and bracelets reminding us of our creativity and energy of the forest. I hope that one of these beauties cross your path one day, be it small or large.